Medals Keep Coming at Peterborough and Ironbridge! The regatta season continued with the Peterborough Junior Championships held over 1000m on the purpose built Cambridgeshire lake. Always a competitive event this year did not break the mould with clubs travelling from around the United Kingdom stretching from Teeside to Kent and many in between. Stratford upon Avon Boat Club’s junior 14 and junior 15 squads made trip to Fenland to taste the competition. 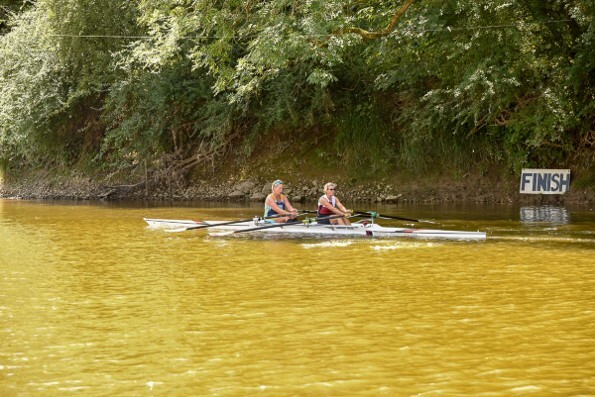 The J14 event began with Elisabeth Edwards missing out on a semi-final place in the single sculls by just one foot. 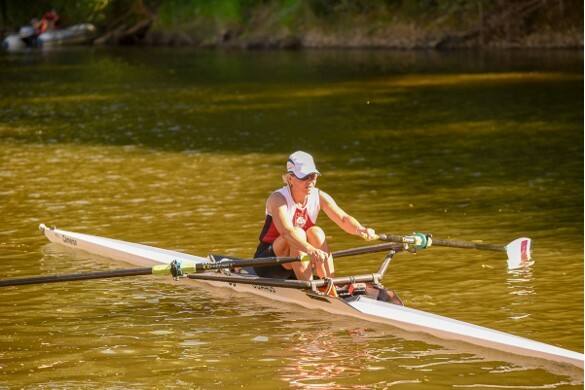 Another competing for the first time in a single scull was Sophie Elstone who after getting through her heat fought hard in her semifinal just missing a finals place. For their first time racing in a single both girls showed promise for the future. Staying with the girls’ singles, Amelie Sartain paced herself well in the heats leading up to her final and came home to win Silver medal place, a great achievement over the blustery 1000m course. William Clarke in his single, faced both strong competition and the windy conditions missing out by only six seconds for a semifinal place. The girls’ double of Martha Usselmann and Sienna Rawlings sculled well on their way into the semifinal, but after a closely contested race were pipped at the post for the remaining final positions. 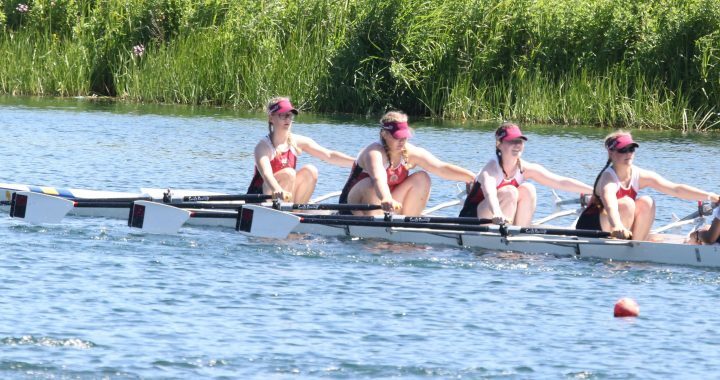 The coxed quadruple scull of Mary Walton (cox), Abbey Meggeson, Emma Harrison, Harriet Hodgson and Julia Zampronio-Gurden confidently won their first heat, however during the semifinal unfortunately suffered an equipment breakage. While positioned nicely ready for the final push, one of the gates holding an oar gave way slowing the boat and ending their race. 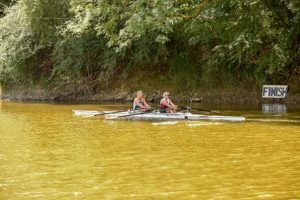 Meanwhile in the J15 events, the action was also red hot. In the girls’ single sculls event Alice Baines, Mya Kenny and Maiya James were relieved to be drawn in separate heats. The strong headwinds caused issues for all with Alice progressing to the semifinal stage then missing a place in the final by just two seconds. In the girls’ coxed quadruple sculls the crew of Jasmine Mountney, Nixie Brunt, Mili Wilcock, Alice Baines and Naomi Sergeant (coxswain) exited the competition early against strong crews from Northwich and Bedford Modern School in the toughest of the three heats. Onwards to the girls’ double sculls where both Stratford crews of Mili Wilcock and Jasmine Mountney plus Mya Kenny and Maiya James won their heats convincingly. Ecstasy turned to agony however in the semi-finals where the journey ended for both boats. Not to be outdone, the junior 15 boys’ squad stepped up with the double scull of Dan Cox and Fred Tyler swept aside their competition in the heats only to be undone in the final. Last but by no means least, in the J15 single sculls Fred Tyler rowed a tactical first heat conserving energy. After waltzing through the repechage to book his place in the final things got spicy with a superb row in the final delivering the second silver medal of the day. Meanwhile at Ironbridge set amongst a fantastic wooded hillside which means that even on the hottest sunniest days, competitors and spectators alike can enjoy the refreshing shade and gentle breeze rustling the trees all around the boating area. Ironbridge is also traditionally a happy hunting ground for Stratford crews and this year was no exception! 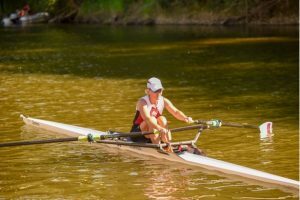 Kjersti Rogneflaten led the way with pots in both the Women’s Masters E double with her rowing partner from Derwent with a very big margin over Evesham in the final. Kjersti then followed up with winning Women’s Masters E in the afternoon with what ended up being a straight final, ideal for avoiding what had been scheduled as a very late finish! Two pots in one day! Christine Goodwin and Tim Lunel had a first race entry more in preparation for the head season than ambitions for winning an open mixed competition. They surprised themselves by how hard they pushed the eventual winners Oxford City despite an interesting start provided by the starts in cross wind conditions. Goodwin and Lunel kept pushing back showing that Masters rowing can provide the stamina the younger competitors lack at times: they eventually finishing just a couple of length down over the line.